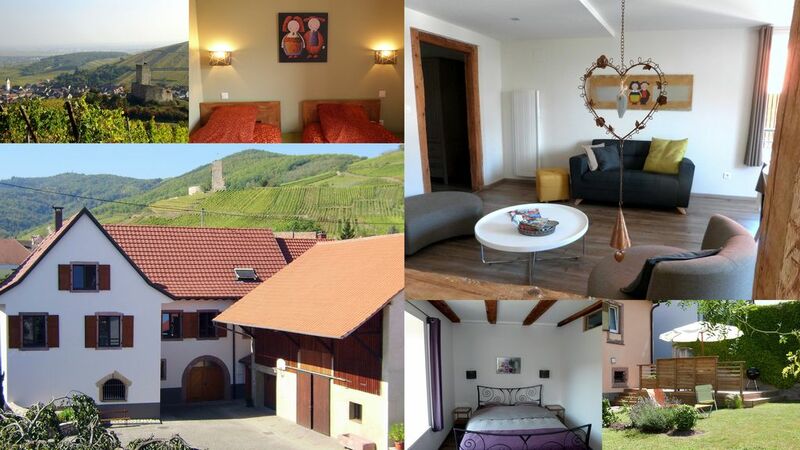 Charming cottage, completely renovated, (classified 4 stars new prefectoral standards); it is located in the charming little wine village of Katzenthal, 1km from the wine route, surrounded by vineyards and overlooked by the Wineck Castle. The cottage is 10 km from Eguisheim (elected most beautiful village in France), 5 kms from Colmar and Kaysersberg. In the heart of the wonderful Christmas markets! Ski resort (alpine, bottom, snowshoeing 30 minutes from the rental, shuttles to the slopes two kilometers from the cottage. Without taking the car directly from the rental, it is possible to make beautiful walks and discover as well as whether on foot or bicycle, vineyards and small town surroundings (véloroute vineyard nearby). Mountain bikes and reservation can rent electric bikes! The entrance to the cottage is separate and opposite the owner, easy access several flights of stairs, cottage on one level. No other tenants in the house. On sunny days, you can take full advantage of the garden and its privileged panorama where we reserve loungers, garden furniture, barbecue. Maximum occupancy: 4 adults and 2 children. Kitchen open to the living room, reading area, bathroom with large walk-in shower, washing machine, towel radiator, separate toilet. Two rooms overlooking the garden and vineyard: one with a bed of 160cm X 200cm and bunk beds; the other with two beds of 90cm X 200cm. Field communal games 200 meters. Non smoking house in the interior of the rental. TTC fares, charges and city tax included. We can not accept pets. Restaurants in the village and small multi-service (bread), all shops and services within three kilometers. Adepts of sports, excursions, running ... we can advise you in your ideas hikes or bicycle. Michel and Isabelle were excellent hosts and have a beautiful home. We enjoyed biking around the area each day, picking up some wine and enjoying it on their beautiful patio each evening. Idéal pour les adeptes du calme. Gîte très agréable et très propre. 3 Tage waren wir zu Gast bei Familie Klur. Die Ferienwohnung ist geschmackvoll eingerichtet und gepflegt. Der Empfang herzlich und gastfreundlich mit Gugelhupf und Wein. Wir kommen gerne wieder. Die Wohnung ist gemackvoll eingerichtet, und es fehlte an nichts. Die Lage ist ruhig und günstig für Ausflüge. Wir wurden von Isabelle und Michel freundlich empfangen. - Sehr nette Vermieter und sehr hilfsbereit!!! Excellent gite & très bon accueil: séjour parfait! Ma femme, mes 3 enfants et ma belle-mère avons passé 3 jours dans le gite "Le Wineck" et avons été très heureux de notre séjour. Le gite tout d'abord est trés bien équipé, bien concu, bien décoré et surtout absolument impeccable. A la fois la grande pièce spacieuse et la terrasse avec vue sur le vignoble permettent de passer des bons moments entre amis ou en famille. Katzenthal est idéalement placé pour entreprendre des excursions à Colmar, Kaysersberg, etc. Et enfin les propriétaires sont très accueillants. A recommender. Nous reviendrons dès que l'occasion se présente de passer des vacances en Alsace. Many museums: NEW MUSEUM UNTERLINDEN in Colmar, 10 minutes from the house, the wood museum in Labaroche, Ungersheim Ecomuseum, Chateau Haut Koenigsbourg, flying of the eagles, mountain monkeys, wine road, cheese road, ridge road to less than half an hour of rental. 45 minutes from the amusement park Europa Park in Germany. We are in the heart of the wonderful Christmas markets.